My pack was particularly heavy this trip as I was carrying both my rather heavy -20 degree F synthetic mummy bag and my four-person mountaineering tent, plus extra cold weather gear such as my ice axe, crampons, and heavier clothing. The Crawford Connector trail was broken, but still had a pretty good layer of loose powder on top of a somewhat icy packed base. This made for slow going, and I was pooped by the time we crossed the footbridge over Gibbs Brook and reached the Crawford Path. I was hoping that it might be easier going beyond this point, since some hikers may have come up the trail from the Crawford Hostel. I stopped for a drink and to adjust my hip belt, then continued struggling uphill under my load. There were a couple of sets of footprints preceding ours. One or two people were climbing with snowshoes, and someone else was hiking with bare boots. And based on the strange grooves in the snow, I figured that someone might be dragging a sled up the trail. We passed the side trail to Gibbs Falls but didn’t stop. After a while, we could glimpse limited views back across the notch to the Willey Range. We trudged on upward as the day wore on, and my doubts began to increase as to whether we would make it all the way to Mizpah Hut before it got dark. To make matters worse, the snow began to get deeper and more powdery the higher we went, which slowed us up all the more. 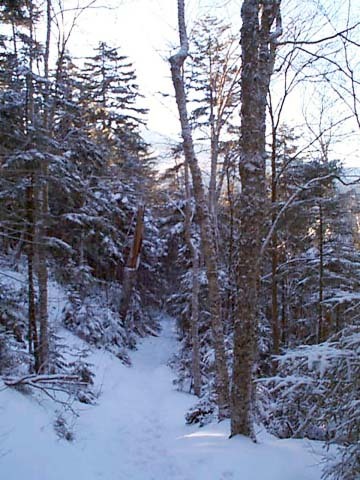 Suddenly, as we rounded a bend, two snowshoers appeared on the trail just above us, coming down from Mt Pierce. I asked them about the trail ahead. They hadn’t been on the Mizpah Cutoff, but said that it was unbroken. My heart sank, knowing that an unbroken trail would make it nearly impossible to reach the hut that day. Then they said that they had seen two guys with plastic sleds on Mt Pierce who were planning on coming down via the hut, and that maybe their sleds would pack the trail some. I sighed. Barely ten minutes after this encounter, I was surprised by the pair in their sleds, who barely avoided running into Muffin as they careened down the trail. They had just come down the Mizpah Cutoff, and figured that their sleds had packed it fairly well. 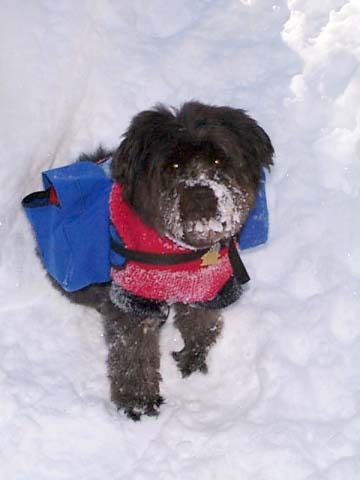 But as Muffin and I continued climbing, I realized that although the sleds had smoothed the snow down some, it wasn’t firmly packed so the going was still time-consuming. Looking down the Crawford Path at around 2500 ft. The trail was snow-covered and more or less packed, but kept getting more powdery the higher we went. Muffin on our way up the Crawford Path. Starting with the loss of her booties near the parking lot, Muffin worked very hard at keeping herself snow-covered and damp.